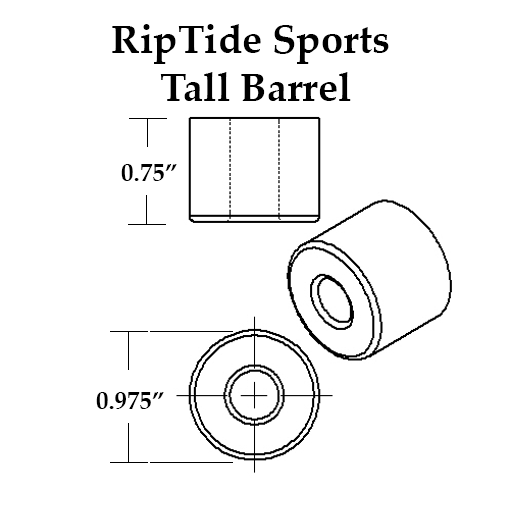 For use in trucks that require Tall Bushings (such as Ronin, Bear Kodiak, Arsenal) TallBarrels offer the next step up in stability above the TallCones and are often used for a broad range of skating disciplines depending on the skaters skill level and personal preference. Awesome as a double-barrel application, but amazingly changeable when paired with a Cone, Chubby or FatCone - depending on whether you're searching to find a carvy, surfy feel (TallBarrel/TallCone), one with more stability (TallBarrel/TallFatCone) or one that is great for flat-out speed (TallBarrel/TallChubby). Harder KranK durometer bushings (96a & 93a) are for heavier-weight riders (over 140lbs) as harder durometer bushings allow for a nice tight set-up. Medium KranK durometer bushings (90a & 87a) are best for medium-weight riders (100 - 140lbs) as well as for those looking for a looser setup in the RoadSide position when coupled with a harder duro bushing. Softer KranK durometer bushings (84a) are best for lightweight riders (50 - 100lbs). Super fun for those looking for a really loose setup. PLEASE NOTE: The KranK Formula has quite a bit of adjustability - so order accordingly! You can tighten the kingpin nut up to two full turns to 'harden' or 'loosen' the duro. Not sure what size bushings your truck will work with? What combo bushings to use? Which Formula to choose?